A place for everyone. A new deck creates a fantastic outdoor space to use for entertaining friends or relaxing with family. Are you looking to create an outdoor living space in your home? Do you want a place to relax or entertain friends and family? If so, a custom deck from Scholar Painting is the perfect solution for your home. 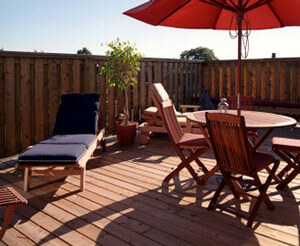 We provide deck building and deck installation services using a variety of quality materials. Our experts will help you develop the perfect plan to suit your needs and provide you with a beautiful finished product. If you're interested in deck design or deck building for your home, call us today at 1-855-234-8952 or click below to get started with a design consultation. We offer free estimates on all our work in Darien, New Canaan, Greenwich, and the surrounding areas. Vinyl is a low maintenance option that is weather and pest resistant. Vinyl offers a great alternative to traditional decking materials. Both hollow and solid vinyl is used for decking, with solid products providing a similar appearance to natural wood. 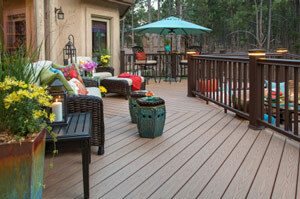 Composite decking offers the best of both worlds between wood and vinyl. Composite decking is an engineered wood product that is composed of materials such as recycled fibers, plastics, and natural wood. This material creates a strong finished product that comes with a pre-finished surface. 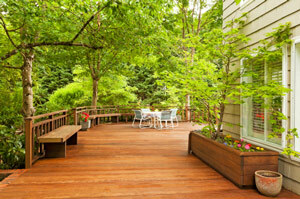 Natural wood is the most common decking material, with a variety of wood types available for your deck. Depending on the type of wood, different colors and designs can be created. Pressure treated wood is commonly used as well for water resistance. 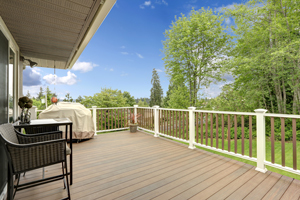 Location: We will help you choose the best place for your deck when factoring in floor layout, sun exposure, landscaping, and backyard features. Size and shape: Depending on what you plan on using your deck for, we'll help you plan areas for seating, cooking, hot tubs, or pool access. Railing styles: No deck is complete without railings, which is why we provide custom railings to perfectly match your deck and home while providing the function you need. Privacy: If you value additional privacy, we will help you choose a the right layout and additional features such as trellises and pergolas. Weather resistance: You don't want to be driven off your deck by too much sun or a rainy day, which is why retractable awnings are a great way to protect your deck and make it more comfortable. If you're ready to install a new deck on your home, the local experts at Scholar Painting are here to help. Our complete deck design and deck installation services will ensure that you get a finished product that you'll enjoy for years to come. Call us today at 1-855-234-8952 or contact us online to learn more about how we can help you with your deck building needs. We offer free estimates in Darien, New Canaan, Greenwich, Old Greenwich, Riverside, Weston, Stamford, Cos Cob, Wilton, Westport, and throughout the surrounding areas.